There’s nothing like making it to the airport and through security, then realizing your options for in-flight food comes down to chips, pretzels, or candy bars. Prepping your own food may be far from your mind when you are packing for a trip, but there is are many benefits to bringing your own snacks and meals. Not only will you eat healthier, but you won’t waste money on overpriced airport food, and you’ll always be prepared in case there is a delay or you’re stuck sitting on the tarmac. Because the TSA is so strict with carry-on baggage rules, many people don’t realize that you can bring most foods through security with no problem. The only things you need to avoid are larger jars or bottles of anything liquid or gel-like, such as yogurt, sauces, dressings, etc. The TSA has a good overview of traveling with food here. With all the traveling I’ve been doing this year, stocking up on healthy foods is always top of my list before a trip. 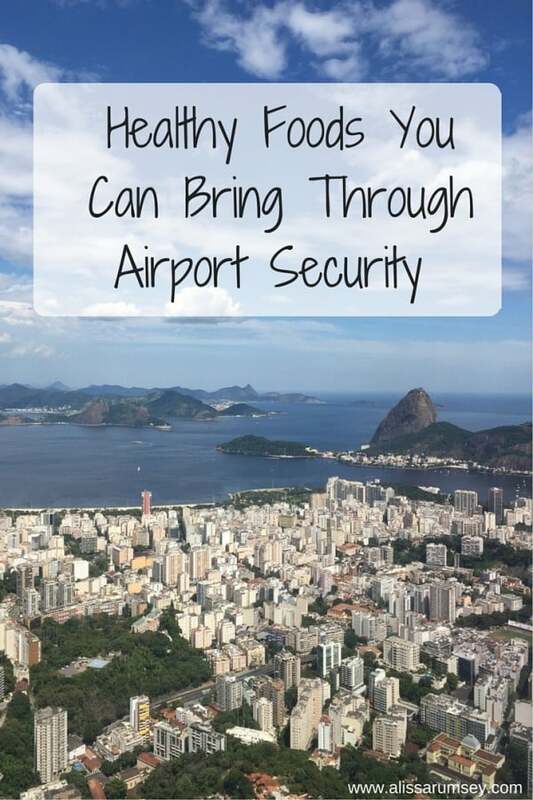 Here are some healthy foods you can bring through airport security. Dried chickpeas or beans – bring a few bags, or easily make your own: rinse and dry a can of chickpeas, toss with olive oil, salt, pepper and other spices, and roast at 450 degrees for 20-30 minutes or until crispy. Flying for over five hours? Pack a more substantial meal, so you don’t have to rely on the highly processed airport or airline foods. Learn how to start eating more mindfully. Quinoa with shredded carrots, bell peppers, chickpeas and avocado. Leafy green salads – these hold up well for a few hours. Pack full of your favorite veggies and fruit, plus a protein source: turkey, black beans, chicken or tuna. Dress the salad before you leave home, or grab a small packet of dressing and stick it in your liquids bag. Lentil or bean salads – lentils and beans hold up well and can be eaten cold or room temperature. Toss with veggies, and an olive-oil based vinaigrette for a high protein and fiber meal. Sandwiches – choose whole grain bread or pitas, and pair with your favorite sandwich meats or grilled chicken, along with hearty veggies like cucumbers and onion that won’t get soggy. Oatmeal packets – quick-cooking oatmeal packets are great for airplane travel. Simply ask for hot water when the beverage cart comes around, stir in your oats, and voila! Choose plain oatmeal, and bring along a handful of nuts, dried fruit, and chia or hemp seeds – these will add some fat and protein to keep you full. For safety purposes, perishable foods such as meat, poultry, and cheese shouldn’t be out at room temperature for more than a few hours. As long as you plan on eating at the airport, or soon after boarding the plane, this won’t be a problem. For longer flights, consider packing a small cooler (ice packs are allowed to go through security if they’re completely frozen). 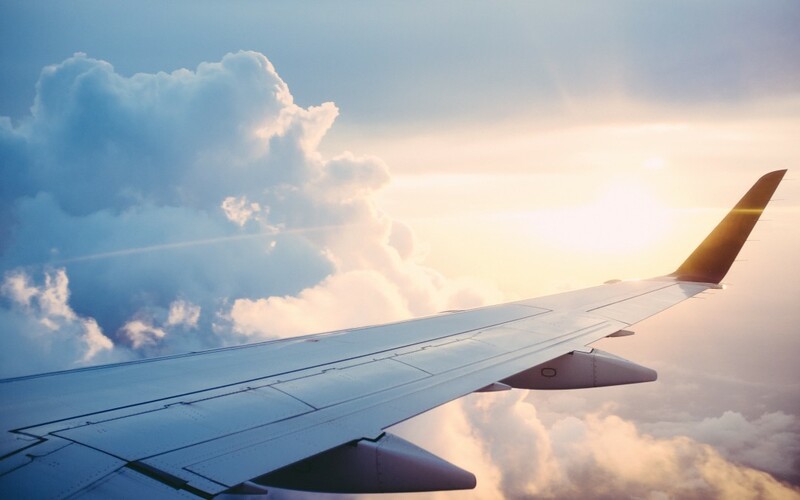 Airport travel can be hectic, but with a little advanced planning, you can travel prepared with healthy snacks and meals to make your flight a little bit smoother. For more travel reading, check out 9 Ways to Stay Healthy While Traveling. Do you have any favorite travel snacks? Share them with me below! I did not know this! Great advice as always. Thanks for this post, I might have to bring more snacks! You are very welcome, glad you found it helpful! Hi, can I just bring oatmeal in a zip lock baggie.? Hi there, you certainly can! I’d just make sure it’s the quick-cooking oats, since the old-fashioned and steel-cut won’t get cooked enough just with the boiling water. Hi! Do you know if I can bring things like chia/hemp/flax seeds on an international flight (checked or carry on baggage)? What about powders like maca, protein, superfood greens? Hi Brooke – I’ve brought seeds on international flights before and haven’t had an issue, but it’s a good idea to check the country’s customs to see what you are allowed to bring. Some don’t allow certain foods to come across borders, but often they aren’t super strict with this. A box of Qia superfood has six packages! It is my go to airline well-being and I always have extras in my “jump bag”. Just get cup of hot water! Has a pumpkin seed and Coconut flavor! Are they allowed on carry on? I’d love to see you add a section for international flights. As I live in a more rural part of S.America, flights to the USA often require travel through multiple countries. I remember climbing off a flight from Ecuador in Miami and having both my salad and fresh fruit taken. They also don’t allow a variety of cheeses, meats, nuts, or eggs. Doesn’t leave a mom of 3 many options…. I don’t mind eating junk once in a while, but often layovers are short, prices are expensive, and my kids suffer the impact of poor nutrition during long stretches of travel (along with fellow travelers as their mood and behavior is impacted as well). Thanks for the feedback Alicia, I’ll consider this for an upcoming post! Did you do an international flight update yet? Wondering about health food bars.. Juice PLUS or Isagenix? Hi Lois, you can definitely bring nutrition bars through security – any kind is fine to bring through. Hi Pamelia, packets of dried oats are fine to pack in your luggage – it’s just liquids and gel-like foods that are an issue with the TSA. Have a great trip! Hi Jamahil – yes this should be fine as long as the salad is absorbing the liquid. They just won’t let you through with any large liquid containers. Has anyone gotten through (or tried) with COOKED, steel cut oats? It would be ideal for me to pack up my hot cooked oats (with a little chicken sausage) in a small container then enjoy on the other side of TSA. I usually fly out pretty early, and the main concern is getting through Security first, then breakfast! For domestic travel this would be fine; some countries don’t allow you to bring fresh fruits into the country itself. What about a pound cake and some cooked meet, salted eggs, jambon and chese sause? Can I bring an already opened container of hummus? If it’s less than 3 ounces, then yes 🙂 More, then no – they’ll treat that similar to yogurt or peanut butter texture, which isn’t allowed. can u bring boxes of raisins on an international flight? Can I bring roasted pumpkin seeds? Do you know? Hi Tara, those shouldn’t be an issue! Thank you for posting this! I read it and I decided that I’ll bring a Mexicali Salad from Trader Joe’s for my flight. I am flying Norwegian and they charge even for water; during my last flight with them I purchased a meal on the plane and it was the worst combo of expensive and terrible. Hi! Can I take some chicken salad that will be prepared in a chopper with some mayo as a snack? Can I take burrito on international flight?. Hi there can I take fried rice with mix meat or bulgur wheat? Can I take packages of yellow dried peas .? Are small packets of GF salad free dressings and gluten free wraps allowed? Hi Pegg – it’s best to check the regulations for each country, as it differs what you are allowed to bring into a new country. Can I bring a box of dipped strawberries?